I feel like I have just exploded in the belly area this past week. The baby moves so much and I have seen the movements from the outside a lot lately which is really neat. The baby room is making some progress. Ivan put together the crib on Thursday night and yesterday we found the rug we want to get when it comes back in stock on Wednesday. We also picked up some really cool mirror and a stuffed broccoli. Very important nursery items. I can't wait to show off the baby room once it starts coming together a bit more. This week I learned that I can't do silly things like cut grapevines. All the reaching and bending did a number on me and I was in quite a bit of lower stomach pain for two days. My stomach muscles did not like it! I'm back to feeling great again now which I am very happy about. That's about all for this week. As usual if you guys have any pregnancy related questions feel free to ask them in the comments. Sometimes I'm not sure what you would find interesting and what is just sort of 'yeah, yeah whatever' information. Have a great Sunday! Today I will be demolishing the dandelions in our yard. We got a fancy weed remover so no bending is necessary. AAhhh you belly it's getting so big :) Can't wait to see the baby room! I bet it's adorable! 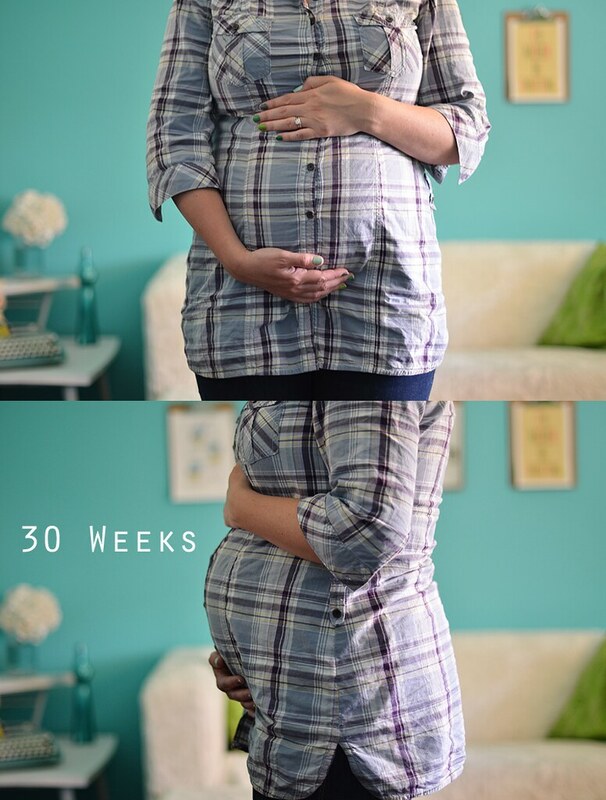 This probably sounds crazy, but I really love bump photos - I think they're so sweet. My sister is due to give birth next week (!!). Love the baby bump photos, and I can't wait to see the baby room! I find it so funny that each week, the hand on top of your bump has less room to move! I do have one question (which you obviously don't have to answer if you think it's too personal). What made you decide that you'd like to have a home birth? I've been curious about home births for a while and I'd love to hear what factors helped you to make up your mind. Um, I love that you are outfitting your kid with a stuffed broccoli. You rock. Yeah!! You better believe it!